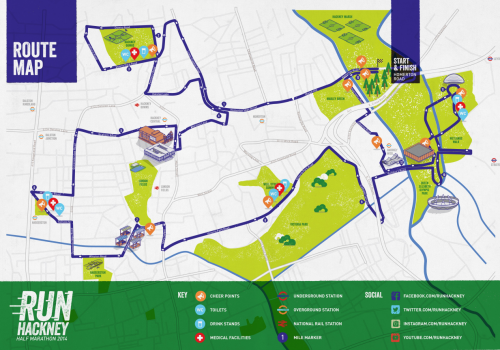 So, we’ve undertaken a bit of an undertaking and signed ourselves up to run Hackney … not the whole of it, *just* a half marathon‘s worth of it, with a whole load of other people on Sunday 22nd June. We’re sure you’ll agree that the route looks pretty spectacular (and takes in a few pubs water stations!). We have got not one, not two, not three, not four, but five, yes FIVE!, trainer-clad people – including Tess and Sophie from our committee – who will be running for us to hopefully raise us some cash, which will ensure that we have a future as an organisation and that we can keep on baking birthday cakes for kids who wouldn’t otherwise receive them. If you can dig into your pocket and move your wallet out the way to grab your smartphone and go online to sponsor us that would be lovely, thank you. And, if you are a trainer-clad type too and would like to join our running team then please email Laura on events@freecakesforkidshackney.co.uk. We most definitely won’t say no. The more the merrier! Remember: there is no I in TEAM, unless it’s the sound of us moaning, whyiiiiiiiii did we sign up to do this again?! Cheerleaders on the day would be awesome too. Check out the loudhailer icons on the map and maybe consider standing at one of them and chucking muffins our way, or something. We’ll have our mouths open just in case. We think that’s it for now but do brace yourself for the fact that we will be pestering you for sponsorship at every. single. possible. opportunity between now and the big day. If we could come round to your house with a clipboard and shake an old margarine tub of change at you then we would! Maybe we should promise to run dressed as giant cupcakes if we raise enough money … what do you reckon?! One of our amazing bakers, the lovely Lucy Lincoln, has joined our team of runners, so now we are six. Six times the reason to sponsor us!